So this Swindon Festival of Literature evening involved a spot of dancing to a cheesy tune, being stuck in a car park, and a wild-ish haired professor. Sounds like a good plot for a book. Which leads into the first event’s theme, Poetry Swindon 78s, where the Richard Jefferies Museum’s writing class used scratchy old 78 RPM vinyl records as a creative prompt. At Swindon Central Library, we heard the tunes and the writers read their work. Nairobi, a bubbly 1958 Tommy Steele number, became a Cold War spy tale by Ben Holloway. Ben’s nervous rapid delivery and breath-catching apologetic gaps suited the memories of a paranoid molehunt. I had enough time to catch Anna-May Laugher’s Ready for the River from a 1928 track by The Rollickers – ‘Want to drown my troubles / and leave just the bubbles’. I was glad I bought the accompanying 78s book and could get to know this poem: a five-part account of a river, a living thing, accepting and eating anything thrown in it – dead things, oar cuts, memories – before it is consumed by drought. This was Chris Tutton’s second visit to Swindon. Six years ago he led a session in the Museum and Art Gallery. 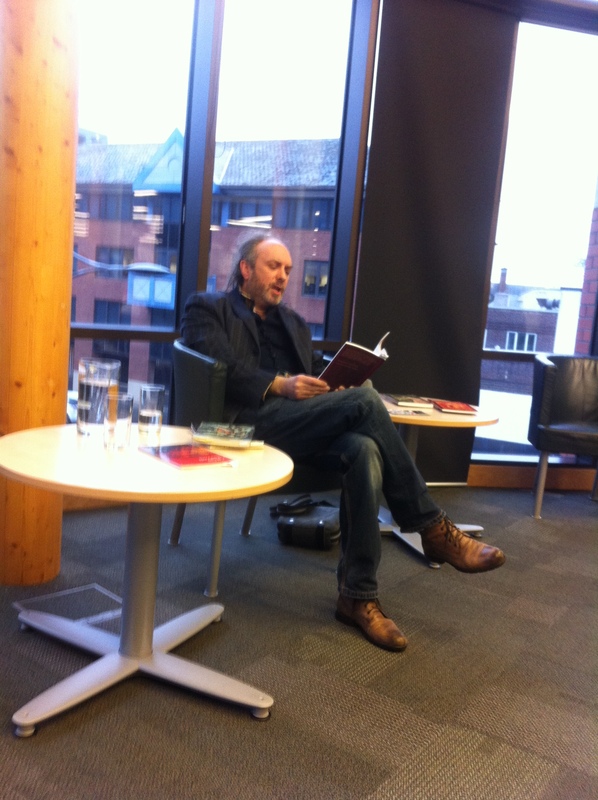 Today [Friday 8 May 2015] he read from his new collection, Angles of Repose, and then offered up the stage to the audience to read their poems. Chris gave performance tips and advice.